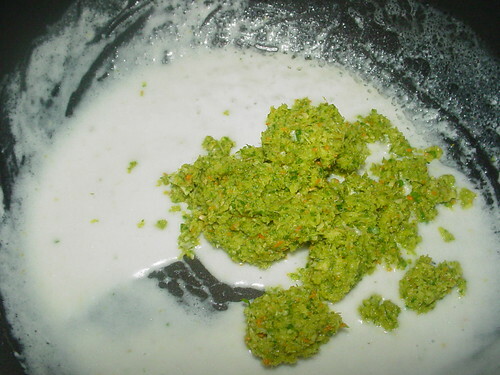 Thai curry paste preparation is typically a bit complex. The number of items that go into the past can be huge, anything from dried shrimp to Kefir lime leaves to coriander roots. This one is a fairly simple one I improvised to make a quick weekday dinner. To make it faster I also used a mini-processor instead of my usual granite mortar and pestle. The result was very good for a tasty Thai-style green curry that took less than an hour from start to finish. The past included garlic, galangal, turmeric (fresh NOT dried…well actually frozen and it looks like a miniature knob of ginger), shallots, lemongrass from my garden, Kefir lime leaves also from my own tree and cilantro. I pulverized the ingredients as well as I could in a small processor than sautéed them in coconut cream. Good Thai coconut cream separates in the can. So, you end up with a top layer of thick coconut cream, almost like sour cream in texture, and a more liquid part that is the coconut milk. Roughly about 30% of each can is cream. After the paste is cooked for a while and a bit dried, I added palm sugar, tamarind pulp, fish sauce and the coconut milk left in the can. 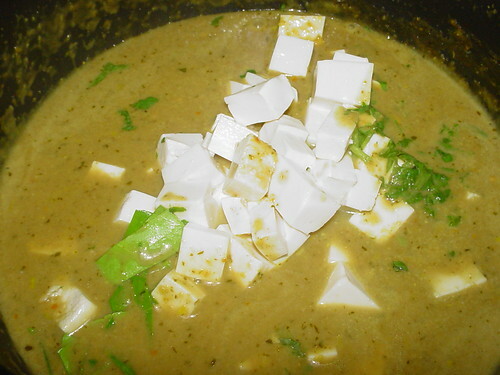 I le this simmer VERY gently (or it will curdle) and then added my cubed soft tofu. I finished the curry with cilantro leaves and some shredded Kefir lime leaves. I intentionally made the curry on the soupy side. 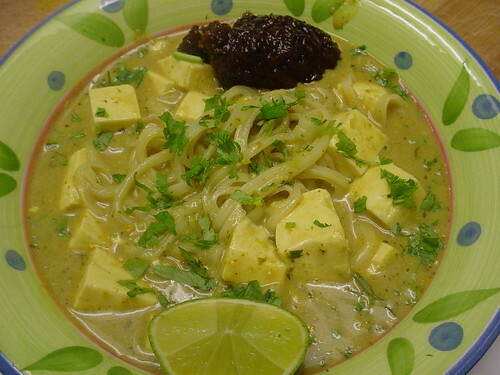 The idea is sort of like a curry noodle soup of sorts! Heresy maybe, but the taste was exceptional. That blob of brown in the opening picture, by the way, is a Thai Chilli jam . I bring that up because it looks odd but it is so delicious. This mixture of chillies, dried shrimp, galangal and shallots among many other things is one of the best recipes I culled from David Thompson’s amazing tome, Thai Food. This green curry calls to me. It says, bring me to Stallion!